Opening note: The Archos 101 G9 used in this benchmark is a final production device with a pre-release beta firmware, benchmark results are not definitive and will be updated as soon as the firmware is updated. 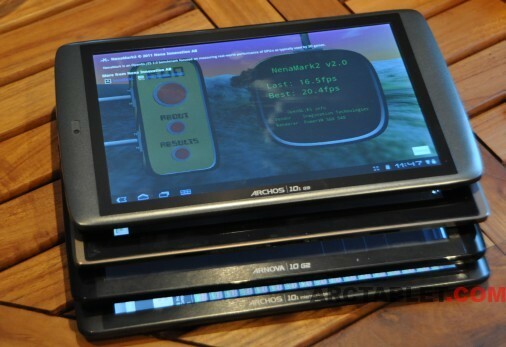 With the release of the Generation 9 tablets, Archos is renewing their tablet line with uptodate TI OMAP processors. The promise of releasing the fastest machines with 1.5 GHz CPU has unfortunately being delayed to January 2012. Still the current version of the Gen9 machines running at 1 GHz delivers quite good performance for the price. We are taking this opportunity to evaluate this new device with other ARM Cortex devices, as we did with earlier benchmarks. This article compares the new Archos 101 G9 1 GHz with it’s older brother the Archos 101 IT, with the new Arnova 10 G2 and an Asus Eee Pad Transformer TF101. Devices where tested with latest firmware available. Please note that by running a single test multiple times we found that some tests are subject to variance of about +/- 10%. 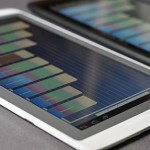 The different benchmarks presented here show that the new Archos 101 G9 running at 1 GHz compares quite well with Tegra2 devices, such as the Asus Transformer TF101. Looking straight at the numbers, The Transformer is a little ahead, but on many tests, both machines gave close results, with less than 10% variation. We are waiting for a final firmware on the Archos G9 in the coming days to update this benchmarks and give a more precise opinion based on final and detailed numbers. Archos will start to ship the G9 devices in Turbo version (1.2 GHz) starting next month, then at increased frequency of 1.5 GHz early next year. To give an idea of the performance increase you may expect for the Archos 101 G9 Turbo running at 1.2 GHz, you can check in comparison our Archos 70 IT benchmark overclocked at 1.2 Ghz. There is a TYPO that need to be corrected. On the table, you wrongly listed “Arnova G2 as Dual-Core (2) on Cortex A8. In reality, all Cortex-A8 is single core. 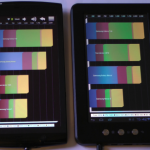 In your original review of Arnova G2, the screen shot from quadrant also list Arnova G2 as “1 cpu”. Great jobs on the comparison. I really enjoy this websites. Thanks to you, I updated my Arnova 10B to Froyo 2.2. However, it suffer from random crash at times. When is the next Froyo updates? Also, is Froyo 2.3 gingerbread possible? That’s right, the typo has been corrected. As you can see, the Linpack benchmark results does not vary in multithread, so the CPU is effectively a single core. An update for the Arnova 10b should be released in October. Android 2.3 Gingerbread port is in the works, we’ll see if something stable comes out. One more mistake to correct: Archos 101 is listed as ‘cortex A9’, when it is a single-core ‘cortex A8’. Thanks for the good work. You’re website is more than helpful. I would love to see a comparison between Arnova G2 vs [ Colby Kyros 1024 ]. 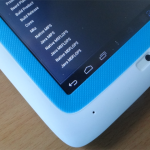 Both tablet are price under $200, both are 10.1″ capacitives, and both share a similar 1GHZ CPU. Arnova is based on Rockchip, and Colby is based on Telechip (samsung) I believe. I wonder which is faster? No idea ;( If someone has the numbers, we will be happy to include them in another benchmark. Corrected as well, thank you Peter. My Arnova 10b (with your kasty 2.2 firmware) get stuck in boot screen today. It was working fine, it was not drop. But today, i cannot boot into android. It just stuck in boot screen endlessly. Any idea how I can fix this? Am I doomed? This is a brand new tablet, and a shame if it is broken already. Rockchip Flashing tools for RK29xx should get you fixed. for the RK29xx flashing tools and procedure. it will be easier and clearer to keep track of the issue.